Tokyo: Sony Corp. sold its stake in the venture with Samsung Electronics Co. Ltd to make liquid-crystal displays (LCD) to the South Korean company after predicting an eighth consecutive year of losses from TVs amid sluggish demand. The stake sale enables Sony chief executive officer Howard Stringer, 69, to shed the responsibility of panel manufacturing amid losses in the TV business, where Samsung is the world’s biggest. To turn around Sony, which has forecast a fourth consecutive annual loss this year, Stringer has announced $8.4 billion of acquisitions in 2011 to bolster the profitable phones and music divisions and introduced tablet computers to challenge Apple Inc.’s iPad. “It’s a step forward for Sony," said Shiro Mikoshiba, an analyst at Nomura Holdings Inc. in Tokyo. Cancelling out the venture enables Sony to become more flexible in procuring panels. Still, Sony continues to face falling prices and heavy fixed costs. 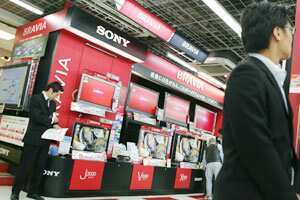 Sony shares gained 1.6% to 1,394 yen at the close of trading in Tokyo on Monday, while Samsung fell 0.2% to 1.07 million won. The deal was announced after the stock market closed for trading. The Nikkei reported the news earlier on Monday. The maker of Walkman music players and PlayStation consoles has declined 52% this year, valuing the company at $18 billion, down from more than $100 billion in September 2000. Samsung has risen 12% in Seoul this year and Apple has jumped 25%. Samsung had 50% of the venture plus one share, while Sony held the remainder, according to the statement. The two companies have also entered into an agreement for supply and purchase of LCD panels, Samsung said in the statement. The transaction and the subsequent agreement will enable Sony to secure a flexible and steady supply of LCD panels from Samsung, based on market prices, and without the responsibility and costs of operating a manufacturing facility, Japan’s biggest consumer-electronics exporter said in its statement. Despite this one-time loss, Sony estimates that the transaction will result in substantial savings, starting January, Sony said in the statement. Earlier this month, Fitch Ratings downgraded Sony’s long-term ratings to BBB-, one level above junk, from BBB, citing difficulties in reviving the money-losing TV business and deals that won’t improve profit. Takashi Amano in Tokyo contributed to this story.